"Lost opportunities, lost possibilities, feelings we can never get back. That's part of what it means to be alive. But inside our heads - at least that's where I imagine it - there's a little room where we store those memories. A room like the stacks in this library. And to understand the workings of our own heart we have to keep on making new reference cards. We have to dust things off every once in awhile, let in fresh air, change the water in the flower vases. In other words, you'll live forever in your own private library." 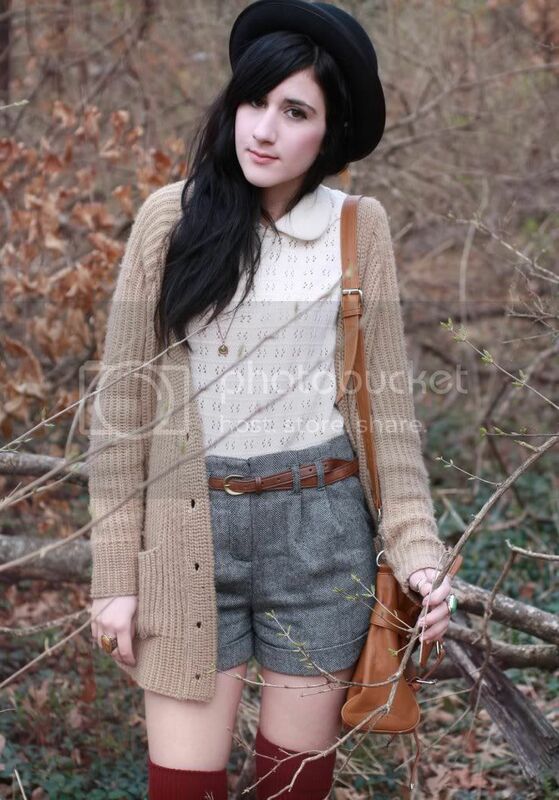 wearing: BDG top; Pins & needles sweater;f21 shorts & knee socks; thrifted shoes. You look amazing and this is such a beautiful, truthful quote! Thanks for sharing! Gorgeous outfit - love the long socks! Gorgeous! I love the knit top! Its great, and the knee highs are perfect. the socks add such a nice touch of colour! You look amazing! Love your socks! Those socks are the bees knees. As is your entire outfit. You make me want a grandpop sweater so stinkin' bad. lovely!!!! looks like such a comfortable and cute outfit! i love it! Wow love this outfit, you look stunning with high socks girl! oh I love socks over the knee!! That hit of red is gorgeous, and I love your top! So so sweet. The outfit is great. Wish it was warm enough to wear shorts here! The socks add such a great color punch. And lovely quote, too. 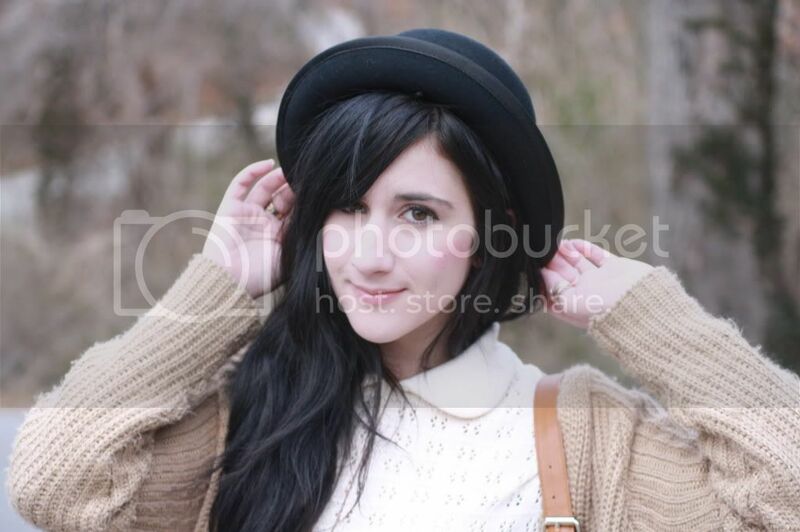 love the way you wear that peterpan collar top with that sweater. but i always in love with your sweater. awww love love love it! that shorts are so so cool! The colors are beautiful, especially the cranberry color of your socks! I love your sweater. And God I wish I had your legs! High socks do not look so pretty on me. I absolutely adore this look, and your photos match the feel of the outfit perfectly. Love your long socks ! I think I've mentioned this before but I adore those shorts! I really need to find a herringbone pair for myself. I love the hints of zenbuddhism that actually shine through in asian literature. Great quote. and dark red is SO good with neutrals! I love the way you paired these knee-high socks with the shoes and neutral colored outfit. very nice look on you as always:) and very wise quote. beautiful quote! it's the kind that truly makes you think. i LOVE those thigh high socks! i've been meaning to pick up a pair, but i can never find any around where i live. boo. Love the knee high red socks. gorgeous! Sweet outfit and a great quote :) Reminds me of Saudade. loooovin' it! (: awesome quote, too. your eyes look so pretty! i really really love those shoes! your shorts look adorable!!! very sweet. That is an adorable outfit! 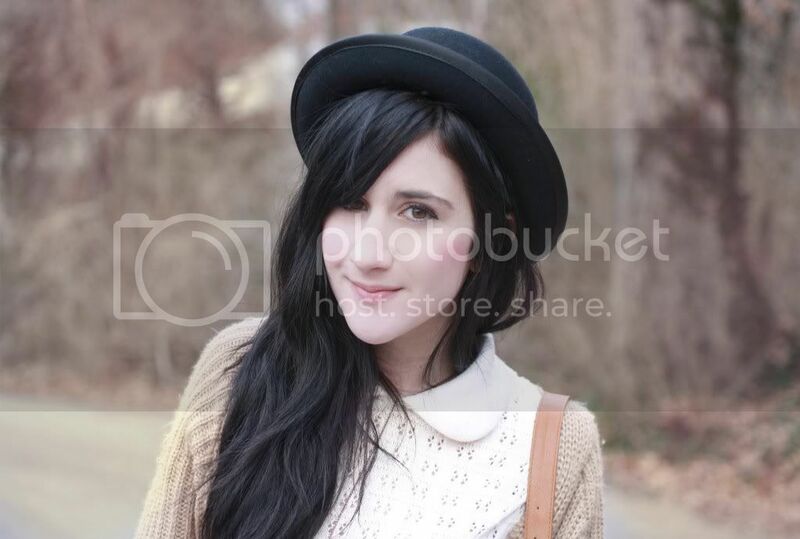 :) I really like your blog. I'm definitely following you. I love this model-esque look on you! this is so so SO cute, I love those shorts with the thigh highs! Beautiful outfit! And WOW, I am so shocked- that quote is from my favourite book, ever! I LOVE Kafka on The Shore, and I advise anyone reading this comment to seriously consider reading any Haruki Murakami book... he is a genius! your outfit is fun! mix and match! That shirt is so amazing. I'm uber jealous. This is such a great outfit to transition from winter to spring! those shorts are so chic! adorable outfit! looks so comfy and warm! Those red socks are a great alternative to stockings, I'm making a point to look for colored thigh-highs! I love the colors in this outfit. The red socks are nice. That is an amazing outfit! you look so lovely! i love the pop of red with the knee socks. fantastic colour of your knee socks!! Yay for libraries! I'm a librarian! 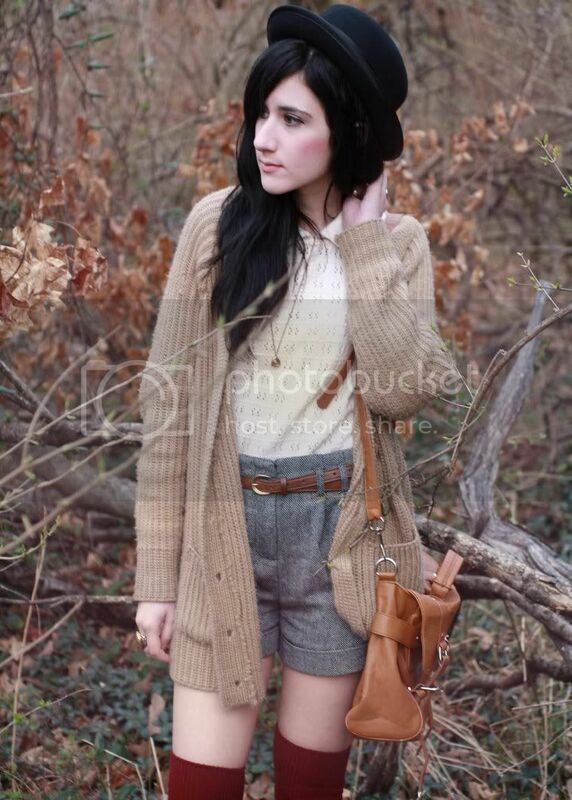 :) Love your look, - especially the long cardigan! wow wow, the red socks super cool :D i love your long cardigan too! like usually, you always looks gorgeous! Wow! Lovee your outfit! Like your style Follow you) Follow me? SUCH a great outfit. you really have style! Those socks are just adorable!!! Once again, love the look you've pulled off!! Knee socks are beautiful! the color is great! love everything Bonnie!! but those burgundy socks are to die for! i like your makeup in this post ..the blush you use makesyour cheekbones look like art. I love this outfit , realy like the burgundy knee highs! So well put together but yet effortless and comfy. I really enjoyed this quote Bonnie. I do the same thing when I can't think of anything to post about, I just kinda find a good quote and go from there. Your outfits are always so cozy, I love them. That sweater is quite amazing! love the color of your thigh highs! Love all the neutral colors in this outfit! and those socks are amazing!